Besides the fact that this is based off of a video game, and the director also directed Harry Potter and the Goblet of Fire, how else is this going to completely fail? No, he isn't. He's producing it. nyway, I think this movie will be good, since Jerry Bruckheimer is producing it. jake Gyllenhaal as the prince? hmmm dont know about that, but i wont judge, he might be great i just have trouble imagining it. God most of the harry potter movies sucked so i think pop movie wont be that great. it's loosely based on the video game to fit the medium of a film. Jake Gyllenhaal as the Prince is a bit insulting. Other actors could fit that role. Even Orlando Bloom; if only he could act. erm... video game movies are usually fail. guess we wont be able to tell until it comes out though. I can't say that I'm super excited for this movie. It has potential to be good. I heard a lot of people wanted Orlando Bloom to be The Prince. I really saw Johnny Depp fitting that role for some reason. 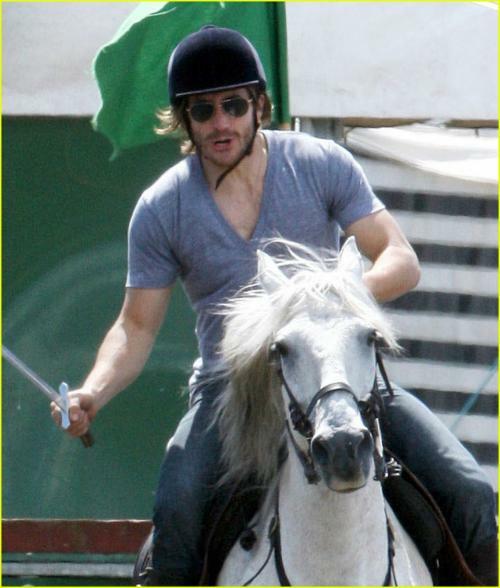 this is Jake preparing for his role in Prince of Persia. ^looks like he grew his hair long. not half bad. he's actually starting to look like the prince. This sounds like an interesting movie and it will probably be made into a trilogy. They are being realeased through Disney right?